My house looks so fabulous right now! I have been cleaning steady since 6 am this morning and I could just bask in the cleanliness! (You can tell by my excitement that my house is not often this clean... sad... but true). I decided that I didn't want to spend my entire visit with my aunt and uncle cleaning my house or worrying about cleaning my house (not that they would care... but I would). So I did it all today. Except the kid's playroom and basement. And the laundry isn't done. It's never done. But the rest looks so pretty. Feel free to stop by and see it if you happen to be in the area (ha! No one is ever in the area. We live in the middle of nowhere!). Anyway... my sons have been relatively good during my cleaning frenzy. The poor kids didn't know what was going on half the time. They kept following me around asking what I was doing and offering to "help". At one point they were "explorers on a helping expedition". Here are a couple pictures of them in their explorer outfits. Yes. 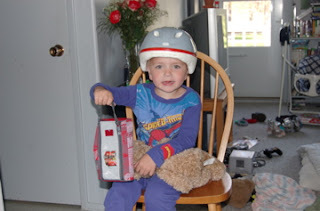 Owen is wearing a bike helmet, spiderman jammies and carrying a pencil case and a teddy bear. How that is an explorer outfit I am not sure but he was very proud. 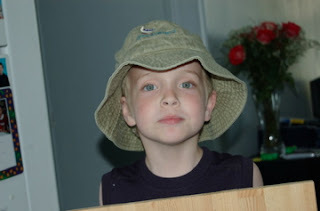 Aiden found the hat my husband bought me on our honeymoon (we went to Salt Spring Island which is a small island off the coast of British Columbia... almost 8 years ago now). Anyway he thinks it is a fabulous explorer hat. Doesn't he look cute? I hope that your house stays clean for a long long time....you go girl! I can't believe it's been 8 years of us all being married. Craziness. And your kids are still the cutest in the world (for 12 more weeks..hopefully not more than that...or i'll be a tank..hehe). My youngest son moved out a few months ago. NOW I feel like it make sense to clean. It DOES feel great though, doesn't it? Your boys look like AMAZING explorers.